My new site is up! Yay! It’s here! You’re on the site right now! Welcome!! Let’s have a party! I brought cookies! And maybe I’ll keep a little speech. You in? Okay? Okay! I’ve been blogging for a few years now and for the last six months I’ve been struggling with it a bit. Sure, there’s been a lot going on that has kept me busy, but I got kind of bored of my site. It didn’t inspire me or encourage me to share new stuff. It felt like it wasn’t me. So clearly, it was time for a change. And so here we are. On my new site. You like it? Luckily I didn’t have to do all this by myself, as I had some awesome people helping me with this site and I’m super grateful for them. It’s not all finished yet (it never really is) but still I’ve got this feeling of excitement and inspiration flowing inside me and it’s just the thing I’ve been searching for in the last few months. What else? You’ll find all my recipes from the top bar under ‘Recipes’. When I went through my archives I got this urge to delete a lot of the old stuff, start a new Instagram account and so on. But… It would be like deleting my own story. Deleting the journey I’ve gone through since I picked up the camera for the first time and had the courage to publish a blog post. It shouldn’t be erased but instead it should be embraced. We all started from somewhere and we’re always growing and getting better, and that’s what’s great in all this. Now that I’ve had my speech, I’d like to welcome the main performer of this party: Double Chocolate Banana Oat Cookies! They’re gluten-free and vegan (if using maple syrup), and oh so good. I’d say I made these for you, but really, I made them for myself to celebrate this moment. And as I’m not seeing anyone else here in our kitchen, I’ll just grab one more.. but if you’re quick, make a batch of these and do join me! I think I used up all my wit in my speech, so I’ll keep the rest of this short. These cookies are crazy good. I kept thinking about the recipe in my mind until I was sure about it, then went to the kitchen, got all the ingredients out and made a huge mess. And I nailed it. 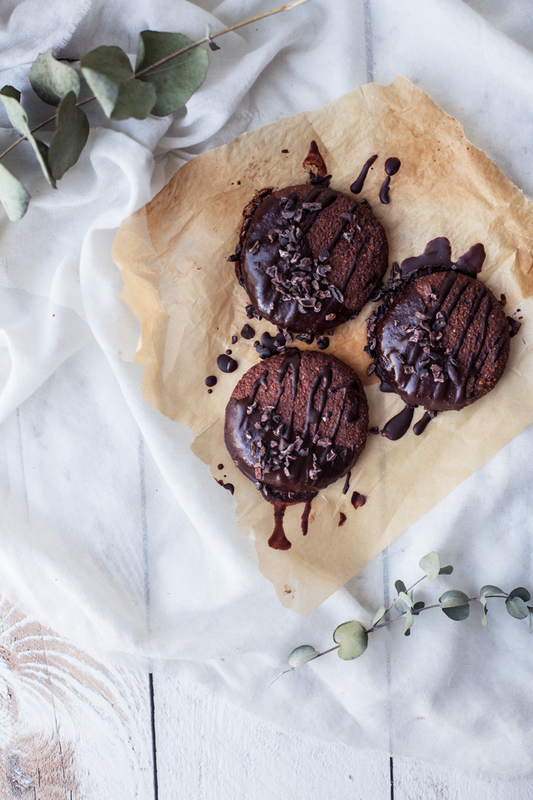 The cookies are soft and chewy and the chocolate glaze makes them sinfully good. The secret ingredient in the cookies is mashed banana, which I love, as it brings a natural sweetness and keeps them juicy. 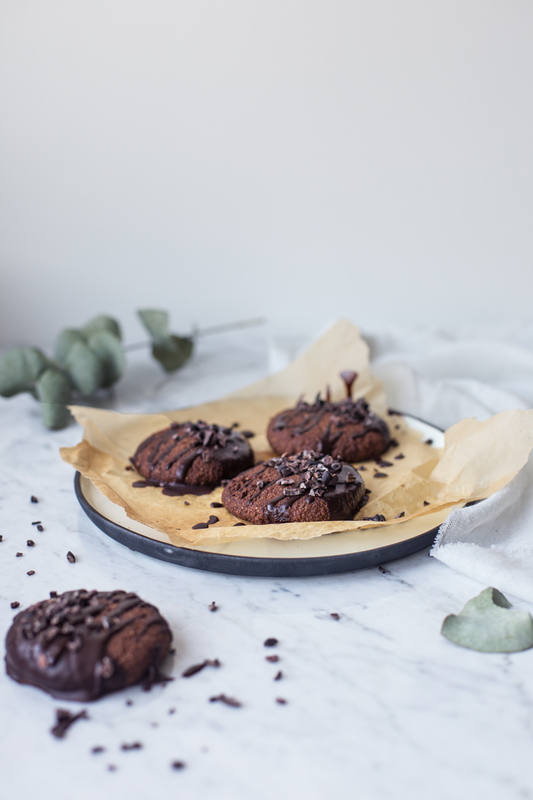 If you’re anything like me and can’t wait to taste your own creations, you’ll want to have the cookie straight after it’s dipped to the chocolate. And definitely do not worry about the stains you’ll might leave to the kitchen floor or the melted chocolate on the corner of your mouth, it’s just part of the process. And if you’d like to take this whole thing to the next level (oh yes! ), make a cup of hot chocolate as your drink of choice. Oh, what a wonderful life. 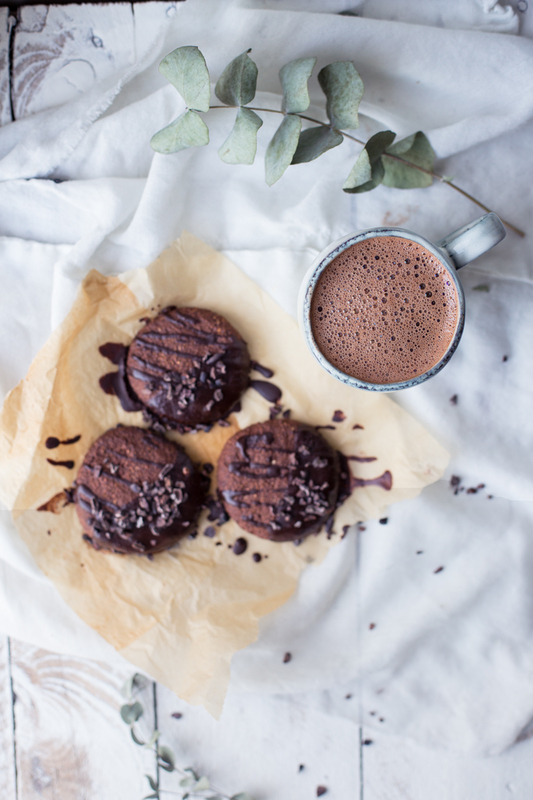 I think these cookies (and the hot chocolate) will get us through the weekend, don’t you think? And then we’ll be ready for next week, as I’ll be sharing some pretty exciting news here..so be sure to come back, as it will be a pretty major surprise! notes: I like to make my own oat and almond flour by grinding rolled oats / whole almonds in a high speed blender until they turn into fine flour. super easy and affordable! these could be amazing with other nut flours too, like hazelnut or cashew meal. Preheat the oven to 400 °F. Chop the bananas into a blender or food processor. Add coconut oil, honey, vanilla, baking powder and salt and blend until smooth. In a big bowl, combine the raw cacao powder and flour and mix. Pour the banana mixture to the bowl and mix well. Melt the raw cacao butter in a warm water bath or in a small saucepan on low heat. Add honey and cacao powder and whisk into a smooth sauce. 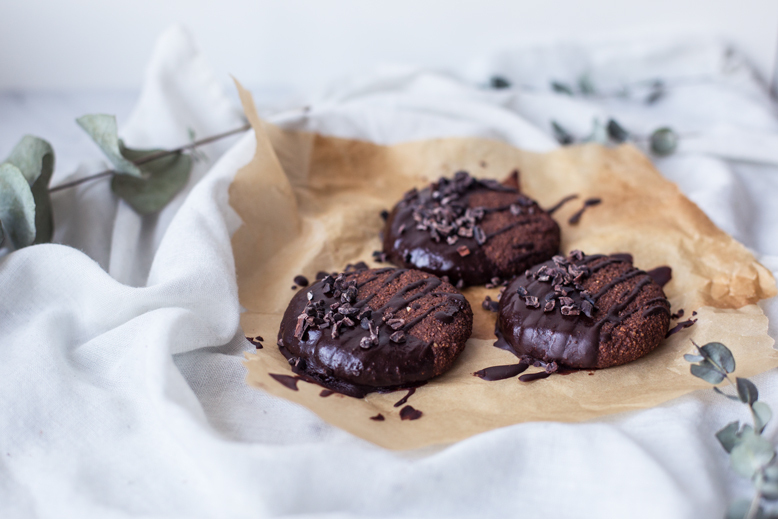 One by one, dip the cookies into the chocolate sauce, place on plate covered with parchment paper and let the frosting set either in room temperature or in the fridge. Once the frosting has set, serve and enjoy! Tagged chocolate, cookies, treats, vegan. Simple and tasty gluten-free Sweet Potato Flatbreads, that require only three ingredients! Your new ‘home’ looks even more cosy and beautiful than before, lovely done, Tuulia! Nice to learn what your name means, it tells so much about you! These cookies should be made asap, amen! Desserts, Cakes – Vegan Recipes, Desserts, Drinks and other Vegan stuff.